This is our last morning in Zamalek. Zamalek is such an oasis of calm in Cairo. It is lovely, tree lined, filled with great restaurants and shops and generally gentrified. It is just across the river from the turmoil of Tahrir Square but it has remained tranquil. Our hotel, Hotel Longchamps, was very gracious. They did not charge us for our first night--the one we were forced to spend in Istanbul. They did not charge us for the driver's trip to meet our missed flight. Gabby, the day desk clerk, pursued our lost luggage like a pit bull. She was as happy to see it delivered as we were. Their driver took us back to the airport. It took over an hour to get to the Cairo Airport. 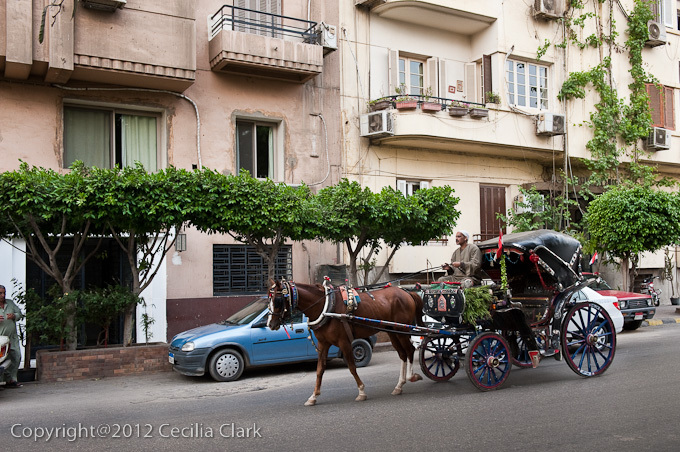 Traffic in Cairo has always been bad, but it is much worse post-revolution. One cause of today's slow traffic was an altercation in front of the Defense Ministry between protestors and people initially described as "unknown assailants." According to news reports, many of the protesters were "hardline Salafi Islamists" upset that their presidential candidate was disqualified. Protestors were also concerned that the military would not bow out after the president was chosen. By the time we drove past the scene, the fires were dying down but several people had already been reported dead. We were on an elevated road and we could see spectators lining the adjacent elevated highway watching the scene below. At the Cairo airport all went well. We boarded a beautiful, seemingly new Egypt Air airbus, and found that our seats were in the premium coach cabin. What a luxury to have room for our knees and legs. After all passengers were on board, the pilot announced that we would need to delay our departure because the air traffic in Istanbul was jammed. We left 30 minutes late. Once in the sky over Istanbul, we circled for about 30 minutes because again the airport was too busy to receive us. Fortunately, we had two hours between connections. Aboard Turkish Air for our flight to Skopje, the plane left late--of course, it was Turkish Air and we were flying out of Istanbul. How can they say they are "The best airline in Europe." Who voted for them? In Skopje, all our worries and setting in place a Plan B for Kali Cat were unnecessary. At immigration, the officer asked me how many times I had been to Macedonia. I answered "twice." Dan said "three times." We were stamped in. I guess the computer system isn't so good at catching illegal aliens. And, our baggage arrived with us on the same plane.